OK guys, I had a 7 AM dental check-up and this is my first break since then. Please forgive any mental fogginess. Also, please forgive me for any general or specific wrongs I have committed that hurt you during the past year, whether via this missive or other venues. I’m sorry. I have found that talking less and listening more is a good way to avoid hurting others, but it’s not foolproof. If there’s anything specific you’d like to discuss with me, please do so. Rosh Hashanah encompasses a wide range of themes: creation of the world; judgement and being called to account (whence the sounding of the shofar), the beginning of a new year (ironically, the Biblical year begins with the month of Nissan; Tishrei as #1 was a Babylonian thing), remembrance (by the Lord). The holiday is grand and intimate at once. Synagogue attendance swells dramatically, prayers invoke feelings of awe (or should anyway), special majestic melodies are used, and services are lengthened by added poetry, prayers, and include an extra long Musaf service. Yet familiar foods and family customs, apples and honey and round challahs, throwing bread crumbs in flowing water (“tashlich”), wishing each other a good and sweet year and personal introspection and acts of forgiveness combine to allow each of us to connect with this season in ways all the grandness can’t. Or maybe the intimacy is what eventually leads us to connect with the grandeur. This is reflected in the Torah and Haftarah readings. Besides the obligatory reading about the obligatory sacrifices (Numbers 29:1-6 each day), we read continuous Torah portions, Genesis 21:1-34, about the birth of Isaac and the banishment of Ishmael, and Genesis 22:1-24, about the near-sacrifice of Isaac (the “akedah”). The first day’s haftarah are is about the birth of Samuel (I Samuel 1:1 – 2:10, which I chanted while expecting the birth of my daughter). Finally, the selection from Jeremiah chanted the second day is about the return of Israel from exile (Jeremiah 31:2-20), but the best remembered image is Rachel weeping for her children (31:20). 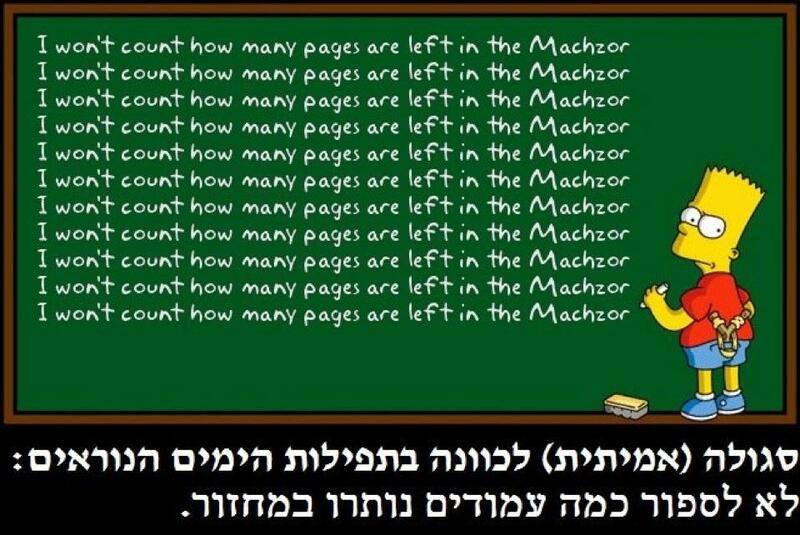 And so begins the 14th year of Torah Portion Humor! WOW!!!!!!! I wish you all a good and sweet 5773. This has become a Rosh Hashanah classic, and I first included Rabbi Israel’s original list and the ones from bethelsudbury here in 2000, added the others in 2003, and last sent out the whole thing in 2008. Remember, you don’t have to show your crumbs to anyone. For those who require a wide selection of crumbs, an attempt will be made to have pre-packaged Tashlich Mix available in three grades (Tashlich Lite, Medium and Industrial Strength) at your local Jewish bookstore. It was Rosh Hashanah evening. In the old Jewish neighborhood, everyone was heading to services. And on his way to synagogue, the Rabbi notices one of his neighbors – an old timer – sitting on a park bench. “Sam. Aren’t you going to services.”? Along these lines, here’s a true story. My synagogue uses a machzor that doesn’t have everything presented exactly in the order of our service. So, for example, certain psalms we recite at the end of the service are back around page 39 or so in a ca. 300 page prayer book. 7. Both have resolutions that last exactly 10 days. · New Yorkers: Escape the honking for some blowing. This September 17, duck out of the New York City hubbub for an hour of refuge at the bandshell in Central Park. Return to a simpler, more essential state, together with fellow New Yorkers. Hear the stirring, unadulterated blasts of the Shofar as we reflect on our collective birthday. And walk away with a message that you were carrying all along. Mendy Pellin shares his sweet techniques for the Jewish New Year. A video is at the above website, but the photo gives you the general idea.